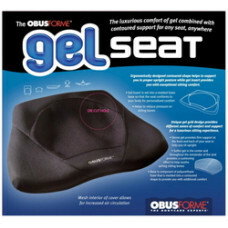 The Obus Forme Gel Seat has the luxurious comfort of a gel combined with the contoured support for any seat, anywhere. 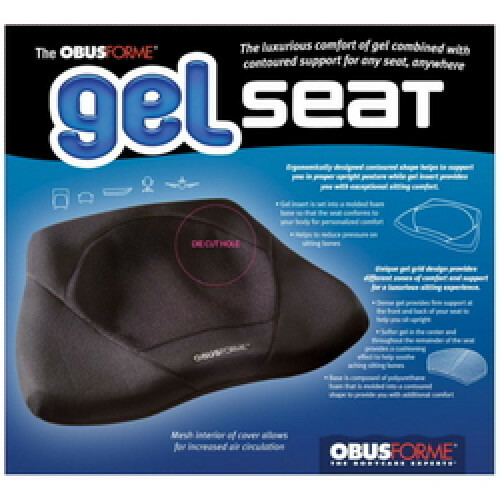 The ergonomically designed contoured shape of the Obus Forme Gel Seat helps to support you in proper upright posture while the gel insert provides you with exceptional sitting comfort. The gel insert helps to reduce pressure on sitting bones and is set into a molded foam base so the seat conforms to your body for personalized comfort. The unique grid design provides different zones of comfort and support for a luxurious sitting experience. The dense gel provides firm support at the front and back of your seat to help you sit upright. The softer gel in the center and throughout the remainder of the seat provides a cushioning effect to help soothe aching sitting bones. The base is composed of polyurethane foam that is molded into a contoured shape to provide you with additional comfort.